Problems of externalities are best resolved at the national level by taxation, but internationally it is negotiated regulation that is required. This essay is about the fact that national social costs differ from international social costs. Governments are likely to be taxing based on national costs only, and thus cause too much pollution. The title assumes that international regulation is more feasible – selfish states suddenly co-operate on regulation. I am going to discuss this point with reference to classical moral hazard and extended principal agent problems (many principals to one international body). I think that taxation harmonisation is a better option than regulation. However, the harmonisation has to be done through international negotiations. Theory – externalities do not exist in Arrow – Debrew economy. They only come to effect when your actions affect other people. Thus to eliminate externalities there are two possibilities – define property rights (equality, distribution problems), or have state regulating (taxes etc, inefficient). Property rights can hardly be enforced any better than they are now, so I will focus on government activity. There is the standard diagram with PMC and social marginal cost (SMC) being different and state taxing to force a socially optimal outcome. I seriously find it too boring to repeat the argument here, but believe me, I can do it if necessary. The essential thing is that the state SMC is not the true SMC prevailing in the world. When UK factories produce pollution that reaches Sweden, then UK has no incentive to increase its pollution taxes. Thus, one needs some sort of international agreement. As in the simple first best economy quotas and taxes are equivalent, one might use international quotas. The good thing is that a system of multiple – principals versus one agent (“The International Quota Dividing Organisation (IQDO)”) can be set up. This has advantages of delegation – every country can say that they are not responsible for harsh regulations. It is the IQDO-s fault. Obviously, there are other considerations that the state will have to take into account. For example, administrative ease, monitoring and enforcement costs, probability distribution of policy errors in the face of uncertainty, effects on the distribution of income and wealth and political feasibility should also be looked at. However, I will not explore these. The current models of simulations (ie “The cost effectiveness of alternative instruments for environmental protection in a seconf-best setting.” Goulder, Parry, Williams, Burtraw, NBER WP 6464) have started to include the second best effects of existing taxes, idea being that if taxes are used instead of quotas, the extra revenue can be used to reduce the distortionary taxes(revenue recycling effect). 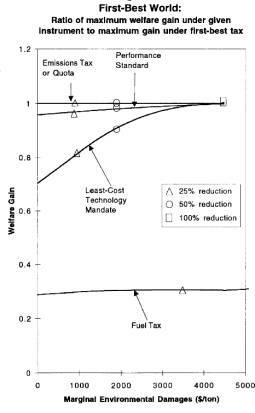 However, existing distortions raise the costs of environmental intervention (tax-interaction effect), Goulder et al suggest that the magnitude is often more than 35%. And while this can by no means generalised to include all possible international externalities, it still suggests, that a much better outcome can usually be achieved by either co-ordinating international pollution permits actions and co-ordinating tax policies, rather than regulating internationally the fuel prices and granted emmission quotas. Although being more efficient, there is a problem with distribution with these policies. Whereas quotas can have an allocative impact, auctions will not take equality into consideration. Whether one actually cares more about equality than reducing pollution, and whether there actually is a feasible mechanis whereby governments could monitor the equality without destroying incentives, is another matter. I would like to present some evidence in favour of property rights and free markets as well. The basic idea is that a clean environment is actually a (luxury) good that people wish to purchase. Estimates indicate that a 1% increase in the scale of economic activity raises SO2 (a pollutant) concentrations by approximately .3%, but the accompanying increase in income drives concentrations down by approximately 1.4% via a technique effect. (Antweiler, Copeland, Taylor, NBER WP 6707) This shows clearly that we should not need to worry about economic growth destroying environment. Although environment protection looks like a classic free rider problem, actually as people get richer they will start preferring goods produced in an environmentally clean manner to exactly identical goods produced in a damaging way. It applies to fair trade goods and other possible externalities as well. Therefore, instead of adopting taxes that hinder growth one might be better off in the long-term by allowing economies to grow and educating people about the environment. Regulation cannot be prevented when the resource is non-renewable, as when it is wasted in the short-term there can be no long-term benefit. However, a bit dirtier climate now could make the environmentally clean products affordable to the next generation without state interventions. 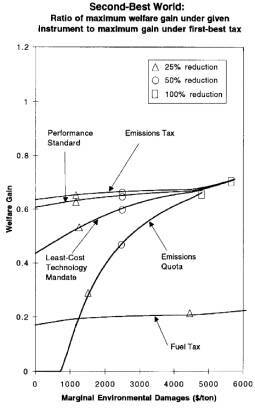 (Elamin Elbasha and Terry Roe , Journal Of Environmental Economics And Management 1996 article no. 0043 “On Endogenous Growth: The Implications of Environmental Externalities”).